Form-fitting basin cushions patients' neck and shoulders. Vinyl bag makes washing quick and easy. 6"D design helps prevent splashing and spilling. 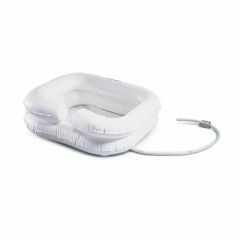 AllegroMedical.com presents The EZ Inflatable Shampoo Basins. Inflatable, secure. Form-fitting basin cushions patients' neck and shoulders. Vinyl bag makes washing quick and easy. 6"D design helps prevent splashing and spilling. Convenient drain hose. Made of heavy-duty vinyl. Folds for easy storage.